Despite dwindling resources and high-stakes testing, public school teachers all over the country are managing to breathe life, passion, and excitement into their classrooms. In this new book by bestselling author A.J. 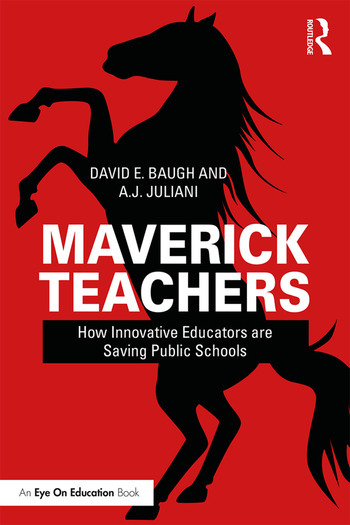 Juliani and lifelong educator David E. Baugh, you’ll meet a diverse group of teachers—Mavericks—who are doing exactly that. You’ll hear from teachers across the country and how they are shaking up the norm. Each story includes a powerful vignette and a breakdown of tactics used, so you can bring inspiration and strategies back to your own classroom. Together, these teachers and their stories will show you how to relate and respond to your students’ most pressing needs, leaving you feeling reenergized in your role as a change-maker. David E. Baugh is the Superintendent of Schools in the Centennial School District outside Philadelphia. A lifelong educator, artist, and athlete, as well as a huge fan of public education, he has presented and written about distributed leadership, school choice, and open education resources. A.J. Juliani is a leading educator in the area of innovation, design thinking, and inquiry-based learning. He is currently the Director of Technology and Innovation for Centennial School District. He is the author of books centered around student agency, choice, innovative learning, and engagement.